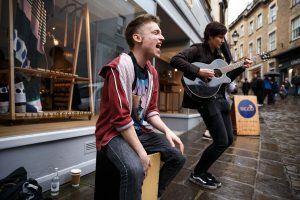 Following the success of last year’s Frome Busks event, the competition is returning to the town centre on Saturday 30 March. Frome Town Council are now calling for entries for this year’s event. Each act will perform a 20-minute set slot before rotating to the next key location in the town, with performances running throughout the day. The competition is open to performers under the age of 25, with last year’s event showcasing some exceptional talent including Fresher & Angel, Garbage Queen, Archie Ttwheam, and James Harriman. The performances will be considered by a panel of judges and the winner will be awarded with the chance to perform at 23 Bath Street and Sunrise Celebration Festival later this year. If you are interested performing at Frome Busks, please contact Vivienne Whitaker atwhitakerv@frometowncouncil.gov.uk for further information.